Honey bees are close relatives of wasps and ants. They are found on every continent on earth, except for Antarctica. Bees of all varieties live on nectar and pollen. It is estimated that one-third of the human food supply depends on insect pollination. Bees have a long, straw-like tongue called a proboscis that allows them to drink the nectar from deep within blossoms. Bees are also equipped with two wings, two antennae, and three segmented body parts (the head, the thorax, and the abdomen). Honey bees are social insects that live in colonies. The hive population consists of a single queen, a few hundred drones, and thousands of worker bees. Buckfast Honey Bees are a hybrid, developed by Karl Kehrle, also known as Brother Adam Adam (1898-1996), who was in charge of beekeeping from 1919 at Buckfast Abbey in Devon in the United Kingdom, where the bees are still bred today. These bees are extremely gentle and highly productive. They have a strong resistance to tracheal mites and good hygienic behavior. However, they are known to be defensive sometimes; not that it is any of your bees-ness! Carniolan Honey Bees (Apis mellifera carnica) are a subspecies of the Western Honey Bee. They are naive to Slovenia, southern Austria, and parts of Croatia, Bosnia and Herzegovina, Serbia, Hungary, Romania, and Bulgaria. Caucasian Honey Bees (Apis mellifera caucasca) originated from the high valleys of the Central Caucasus. Georgia is the central homeland for the subspecies, although the bees also can be found in Eastern Turkey, Armenia, and Azerbaijan. They have a long history of importance to beekeeping worldwide. They were first introduced in the United States in 19th century. The Russian Revolution and consequent annexation of Georgia by Red Army in 1921 halted the export of Caucasian bees. Subspecies were studied and cultivated primarily by Soviet entomologists. Soviet officials were concerned about preserving the purity of the Caucasian species and outlawed any export without special permission. Cordovan Honey Bees are a subset of Italian bees with more yellow coloring. They are also gentler than their Italian cousins and slightly more likely to rob. They are quite striking to observe, with bright yellow bodies and a lack of stripes. They are rarely available in a package of bees, unlike Italians, so are often considered wilder. There are no Honey Bee breeds that start with the letter D.
There are no Honey Bee breeds that start with the letter E.
There are no Honey Bee breeds that start with the letter F.
German Dark Bee, also known as The European Dark Bee, was brought from Northern Eurasia in the colonial era. This subspecies has since then been segmented further into sub races of German Bees due to their hardiness. They are able to survive long, cold winters more often than other strains of honey bees. However, due to their defensive nature and susceptibility to brood diseases like American and European foulbrood, this stock has lost significant favor with beekeepers all over the world. There are no Honey Bee breeds that start with the letter H.
Italian honey bees (Apis mellifera ligustica) are thought to have been originated from the continental part of Italy, south of the Alps, and north of Sicily. The subspecies may have survived the last Ice Age in Italy. They are genetically a different subspecies than that from the Iberian Peninsula and from Sicily. They are the most widely distributed of all honey bees, and have proven adaptable to most climates from subtropical to cool temperate, but they are less successful in humid tropical regions. They are sometimes called the Ligurian Bee. There are no Honey Bee breeds that start with the letter J. There are no Honey Bee breeds that start with the letter K.
There are no Honey Bee breeds that start with the letter L.
Minnesota Hygienic Honey Bees are the result of the work of Dr. Marla Spivak, and her team of the University of Minnesota. Minnesota Hygienic Honey Bees are bred specifically to resist certain brood diseases, such as American Foulbrood and Chalkbrood. The Minnesota Hygienic Honey Bee is also bred to groom itself and other bees within the hive to detect Varroa mites. In addition, they possess the ability to detect Varroa mites on or within the honeycomb cells. However; they are still susceptible to other things that threaten entire colonies, such as colony collapse disorder. 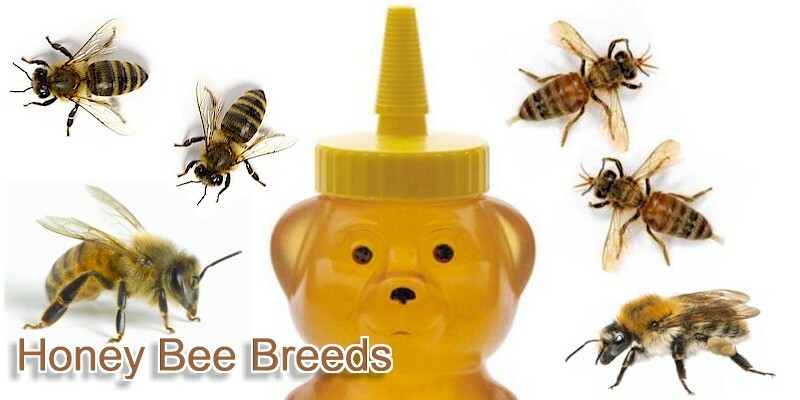 There are no Honey Bee breeds that start with the letter N.
There are no Honey Bee breeds that start with the letter O. There are no Honey Bee breeds that start with the letter P.
There are no Honey Bee breeds that start with the letter Q.
Russian Honey Bee refers to honey bees (Apis mellifera) originated in the Primorsky Krai region of Russia. This strain of bee was imported into the United States in 1997 by the USDAs Honeybee Breeding, Genetics an Physiology Laboratory in Baton Rouge, Louisiana in response to severe declines in bee populations caused by infestations of parasitic mites. Since then they have been used in breeding programs to improve existing honeybee stock. There are no Honey Bee breeds that start with the letter S.
There are no Honey Bee breeds that start with the letter T.
There are no Honey Bee breeds that start with the letter U. There are no Honey Bee breeds that start with the letter V.
Western Honey Bee (Apis mellifera) - also known as European Honey Bees - are the most common species of honey bee worldwide. They were one of the first domesticated insects, and they are the primary species maintained by beekeepers to this day for both its honey production and pollination activities. With human assistance, the western honey bee now occupies every continent except Antarctica. Because of its wide cultivation, this species is the single most important pollinator for agriculture globally. Honey bees are threatened by pests and diseases, especially the Varroa mite and colony collapse disorder. There are no Honey Bee breeds that start with the letter X. There are no Honey Bee breeds that start with the letter Y. There are no Honey Bee breeds that start with the letter Z.